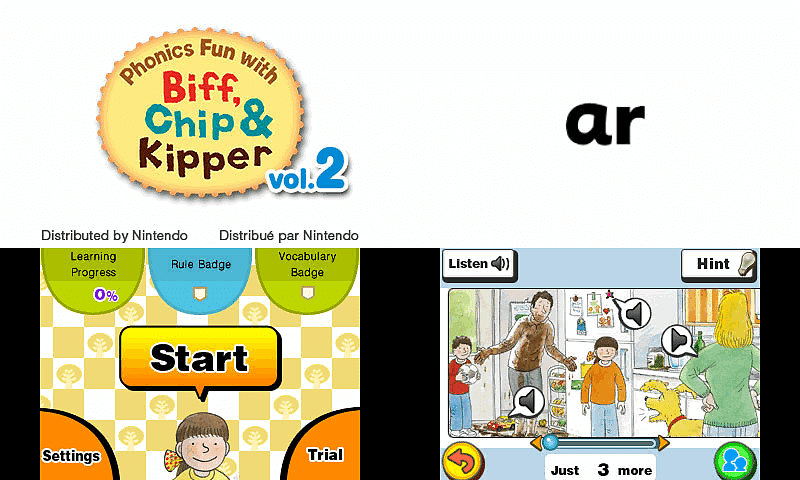 Join Biff, Chip and Kipper for Level 3 of Phonics Fun on Nintendo 3DS. About The GameMany parents may already be familiar with the phonics method used in the popular textbook stories of Floppy's Phonics from Oxford Reading Tree, but via the many fun and intuitive features of Nintendo 3DS and 2DS systems, the series is set to be presented in a more interactive way than ever before. Consisting of three volumes packed with games devised by educational experts that are both motivational and rewarding, Phonics Fun with Biff, Chip & Kipper take scenes and illustrations from the well-respected series of books, and uses the same synthetic phonics method, which introduces individual letter sounds to children before blending them together to read a word. 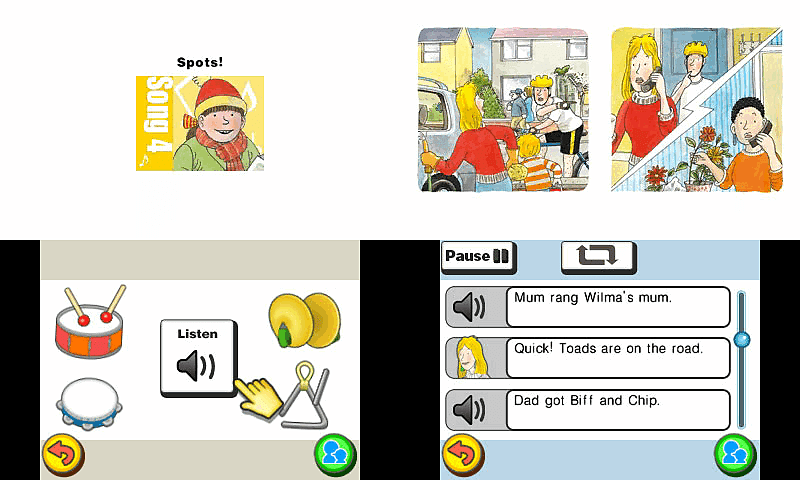 As a way for kids to develop digital reading skills while using their fun and familiar Nintendo handheld consoles, Phonics Fun with Biff, Chip & Kipper brings to life the stories using touch-screen features for simple navigation during exercises, fully spoken instructions, and microphone playback for children to record their voice and check their pronunciation skills. Meanwhile, parents are encouraged to support their children and join in the fun, with the chance to sing along to songs with their kids, read aloud story lyrics, and for those eager to keep track of a child's progress, can even check out useful data on how they are faring after each set of exercises. Also for parents, a handy Parents Guide is included with each game to learn more about the exercises and the teaching methods they use. There are volumes of Phonics Fun with Biff, Chip & Kipper are packed with exercises that are quick and easy-to-complete, and which provide encouragement - such as providing fun exercise completion stamps - at all times, especially when the tasks become more sophisticated. Such is the depth of content in the three volumes that each one contains the equivalent of over 30 Oxford Reading Tree textbooks! Oxford Reading Tree holds an unrivalled position in early years learning.